Nestled among the rolling, picturesque hills of Ohio’s Amish countryside is Der Marktplatz. This is the home of Breitenbach Wine Cellars, exclusive producer of an extensive array of award-winning grape, fresh fruit, and berry wines and Dandelion wine! Our store in Amish Country is open Monday-Saturday from 9-6. Our cafe is open Monday-Saturday from 11-3. Our wines are made on the premises, and visitors are invited to enjoy a winery tour during our Dandelion May-Fest held the first Saturday of May. 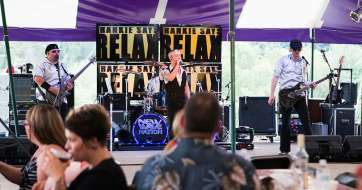 Come listen to different artists play acoustic, easy-listening music on the patio. Fred's BBQ serves up famous baby-back ribs, pulled pork, and other barbecue favorites. Click below to see our full event calendar, featuring Yoga in the Vineyard, festivals, concerts and more! Never be without your favorite Breitenbach wines ever again! Shop online and have our wines delivered straight to your door. 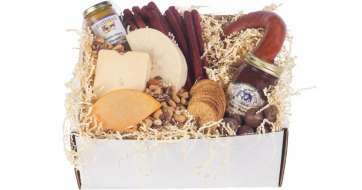 Gift baskets, Country Meats, and Cheeses are also available in our online store. Click below to shop now! 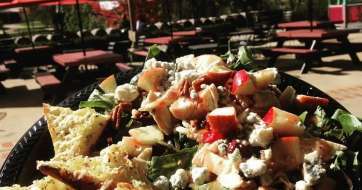 Come enjoy a glass of your favorite wine paired with wood-fired pizza, or a fresh salad. Indoor and outdoor seating is available year round. Click below to see our menu! Come learn how wine is made! Come see our laboratory, and learn about the process that grapes go through to be made into award-winning wines. Tours are every Friday and Saturday at 11am, 1pm, and 3pm. Contact us for more information.